Every element in Visual Composer has a custom background option that can be applied via Design Options. For container type elements, CSS gradient background is available. To set a background color, open element Design Options, and select background color with color picker. 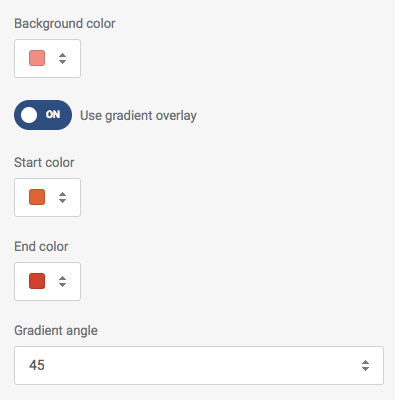 CSS gradient background is available in container type elements Design Options, navigate to ‘Use gradient overlay’ toggle and enable it to select gradient colors. In addition, it is also possible to select a gradient style and angle. Tip: CSS gradient background will be placed as an overlay on an existing background color or image/video. Experiment with a color alpha channel (transparency) in color picker to create a transparent background effect.